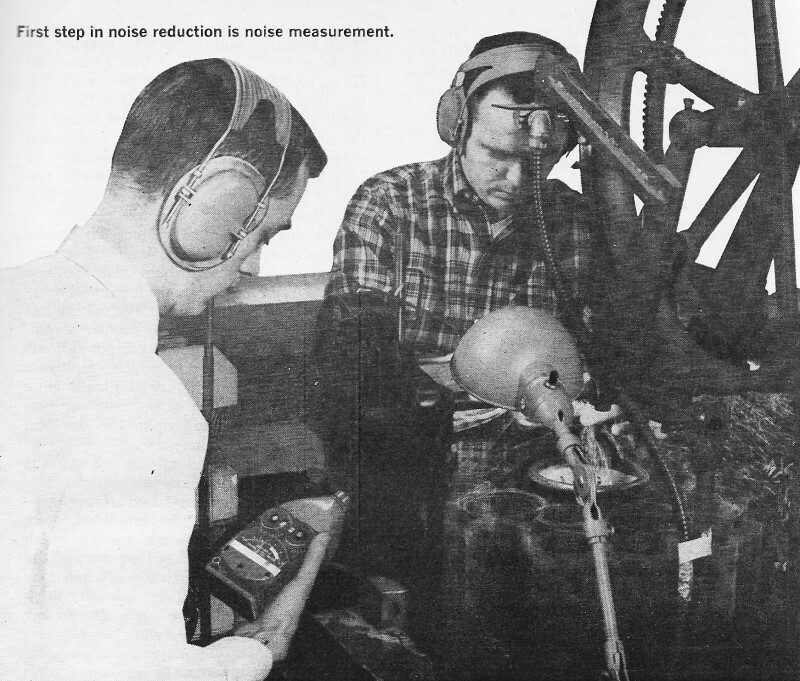 This article on noise measurement is not about electrical noise, but rather on audible noise. 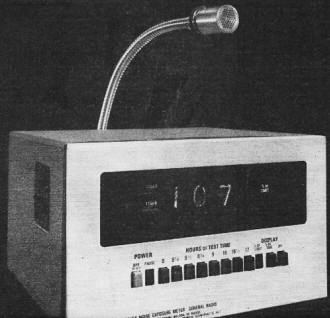 It appeared in a 1973 edition of Popular Electronics magazine during an era when hi-fi stereo equipment was becoming a big deal. 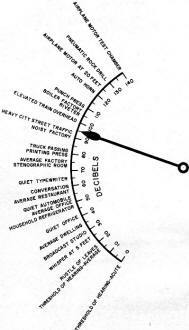 Author Carl Alsen, an engineer at General Radio, reviews methods of sound level measurement and presents values for some familiar sources. 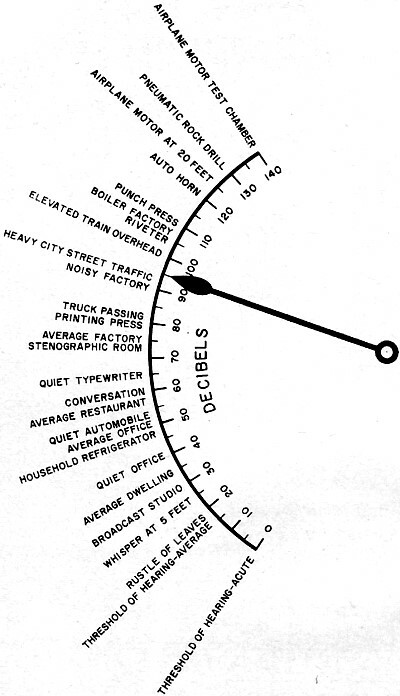 Radio manufacturers had/have a vested interest in background noise that affects the satisfaction of their customers. Ambient noise in all realms has been a rapidly growing problem in terms of information transmission and reception. Many articles were written in the decades of the 1960s and 1970s as more and more people became engaged (e.g., Electronic Pollution ... An Impending Crisis, Acoustical Tile - A New Hi-Fi Component, The Dolby Technique for Reducing Noise, etc.). By Carl W. Alsen, General Radio, Concord, Mass. Studies in acoustics-particularly psychoacoustics - require measurements of the effect of sound upon people themselves and their hearing. Since our hearing is decidedly nonlinear in response, so also must be the measuring instruments. Over the years, a number of specialized sound measuring instruments have been developed for the acoustics specialist. Today, however, noise has become a common worry of a host of nonspecialists. The airport manager, plant engineer, and manufacturer of noise-generating snowmobiles, power mowers, and all manner of appliances must concern themselves with the noise problem and people's reactions to the noise itself. To satisfy the consumer and the growing number of noise-control laws being passed, these nonspecialists must make noise measurements. Hence, what was once the specialist's instrument is rapidly becoming the nonspecialist's weapon in the battle against noise. To understand how noise-measuring instruments operate requires some knowledge of the ear mechanism and how it behaves. Fig. 1 - Normal sounds fall in range from 0 to 140 dB. Instruments which are used to measure sound read in dB. The Intriguing Ear. One startling fact about the human ear is that it can handle an immense variation in sound intensity. A high-level sound just short of the pain-threshold is 10,000,000 times as intense as the quietest sound the ear can detect. The whole hearing mechanism responds to this wide range of sounds in an exponential manner such that noise increased three­fold appears to the human ear as though it only about doubled. Hence, by expressing sound level in logarithmic form, we have an approximate expression of loudness. For this reason, and because smaller numbers are easier to handle, the decibel, abbreviated "db" in scientific notation, has been adopted as the unit of measure for sound level. The decibel is defined as 20 times the logarithm of the ratio of sound pressure level to a reference level, or 0 dB. As shown in Fig. 1, normal sounds covering a ratio of levels of 10,000,000: 1 can be expressed over a 140-dB range. About the smallest normally perceptible change in sound intensity is 1 dB. All sound-measuring instruments give readings in terms of decibels. As concerns frequency response, human hearing is not as flat as even the poorest "high-fidelity" audio system, varying as much as 50 dB (a ratio of 300:1) from 50 Hz to 10,000 Hz. Even more perverse is the fact that this response changes with sound level; the response to high-level sounds is the best, but still not very good. A common evidence of this effect is the necessity of boosting the bass response of an audio system at low levels to keep the effect of flat, or at least pleasing, response. Like any mechanical system, the human ear has an elastic limit beyond which temporary or even permanent damage can occur. Depending on many factors - the nature of the noise and the individual himself - this can occur at levels as low as 85 dB. Recent federal legislation has imposed limits upon the noise levels to which employees may be exposed in industrial plants. In a characteristically nonlinear fashion, permissible levels depend upon the duration of the exposure to the noise. Fig. 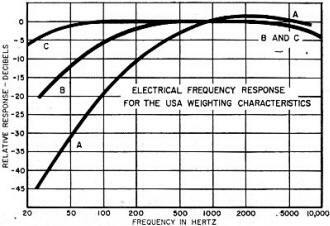 2 - The curves show weighted response characteristics specified by the American National Standards Instruments. Finally, we find nonlinear effects the most unpredictable because the listener is a human being. The irritation a noise generates depends upon the emotional state of the listener at any given moment as much as it does upon the level or frequency of the sound itself. We are further confounded by the many other little-understood psychological facets of hearing, like our ability to sort out one voice in a general din. Earlike Instruments. If measuring tools are going to be useful to the acoustician or psychoacoustician, they must simulate one or more of the peculiar nonlinearities of human hearing. The basic sound-measuring instrument is the sound level meter (SLM). 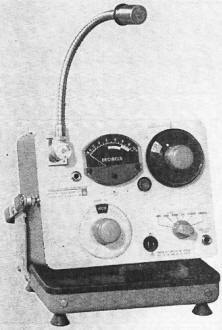 The term "sound level meter" describes a very particular set of characteristics defined by the American National Standards Institute in Standard S1.4-1971. In simple terms, the sound level meter is an a-c voltmeter with a microphone to convert sound energy into an a-c voltage. The addition of a step attenuator, some special filtering networks, and a shaped-characteristic meter sets it apart as a sound level meter. To simulate the logarithmic response of the human ear, the sound level meter is equipped with a meter movement designed to compress the reading so that the scale spans about 16 dB (a ratio of 40:1) and is approximately linear throughout its scale. The attenuator is adjustable in about ten steps of 10 dB each so that, with the range of the meter, a total measuring range of about 30 to 150 dB is attained. As a logarithmic voltmeter, the SLM has a range of about 5 μV to 5 V rms. Many models can be adapted for use as audio rms voltmeters by the substitution of a connector for the microphone. Octave-band noise analyzer permits a rapid frequency analysis of noise to aid identification and treatment of separate sources of noise components. The ear's frequency response, depressing to an audiophile, is also a problem to the SLM designer. The ANSI standards for the SLM specify A, B, and C weighting curves (Fig. 2). These were originally designed to approximate human hearing frequency response at levels below 55 dB (A weighting), from 55 to 85 dB (B weighting), and above 85 dB (C weighting). Now, however, the A-weighted sound level is the most widely used regardless of the intensity of the sound to be measured. In fact, the industrial noise provisions of the Occupational Safety and Health Act of 1970 specify A-weighted, dB (A), measurements. SLM Circuits. To achieve the required weighted responses in one sound level meter (Fig. 3), weighting networks are inserted into each coupling and feedback path. The feedback network in the main amplifier provides the 6 dB/octave roll-off at 8000 Hz required for each weighting curve. 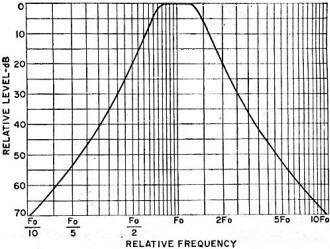 The C weighting, the most nearly flat of the weighted responses, has a specified low-frequency roll-off at 32 Hz, which is inserted in the coupling between the preamplifier and main amplifier. This is switched out for the B and A weighting. Low-frequency roll-off for B weighting is accomplished at the input to the preamplifier with a shunt resistance across the microphone capacitance for roll-off at 160 Hz. Response shaping at this point in the circuit helps reduce the likelihood of overloading the amplifier. A weighting, the most sharply modified response, is obtained with the addition of a 733−Hz roll-off network in the main amplifier and continued use of the microphone capacitance for an even faster roll-off below 107 Hz. Attenuation is introduced in two sections for best signal-to-noise performance and overload control. 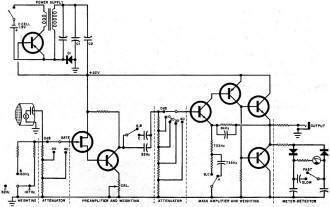 As attenuation is required, it is first added between the preamplifier and main amplifier, reducing preamplifier noise as well as the signal. Beyond 40 dB, attenuation is added at the input to the preamplifier to reduce the signal from high-intensity sound, preventing overloading. Through the distribution of both weighting and attenuation networks, each stage of the amplifier is able to operate on signals of optimum size. The simple dc-to-dc converter circuit, which permits operation from a single 1.5-volt C cell, is basically a tuned self-biased Class-C oscillator operating at 130,000 Hz. The transformer output is applied to a full-wave voltage doubler rectifier consisting of diode D1, the transistor's base-emitter junction, and capacitors C1 and C2. Half of the dc output voltage biases the transistor in the cutoff region. This class C operation results in about 70 percent conversion efficiency and 50 hours of instrument operation from one C cell. Measuring Noise Danger. Today's growing concern with noise pollution in industry centers on hearing damage and on annoyance that results in increased irritability and lowered productivity. The length of exposure to loud sounds must be considered in the evaluation of potential danger. The current laws state that any exposure to levels above 115 dB (A) is too much, while unlimited exposure is permissible to sound levels of less than 90 dB (A). Intermediate levels are permissible for limited periods of . 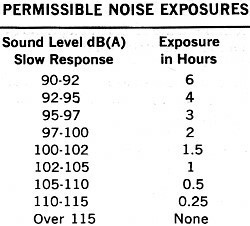 time, as shown in the Permissible Noise Exposure Table. A sound level meter can be used to monitor noisy areas, but to determine the legality of the noise by these standards requires frequent measurements over a working day, followed by calculations to combine the contributions of the various levels measured and their durations. Fig. 3 - Weighting networks are used in the sound level meter to achieve the responses as shown in Fig. 2. Each weighting gives a different roll-off. A noise exposure meter combines a sound level meter and an exposure calculator designed to provide unattended operation and a correct readout. Fig. 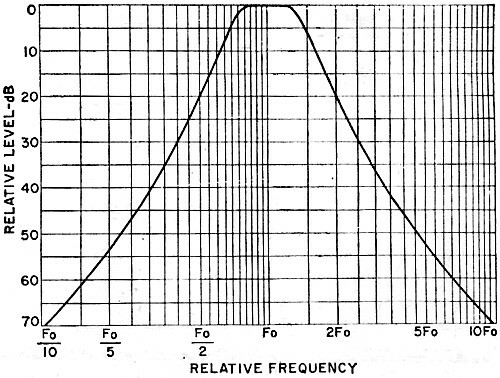 4 - In an octave-band filter, the 3-dB points are just an octave apart. To eliminate the tedium of such measurements and the chance of calculation errors, a noise exposure monitor has been developed to operate unattended for a full working day, measuring and calculating under control of an internal timer. Once turned on, the monitor makes regular A-weighted measurements of the sound level, determines which band the noise falls into, and accumulates counts at a rate in proportion to the severity of the noise. Monitors designed for in-plant installation display the accumulated counts as a reading of the percent of allowable total exposure. Small monitors designed to be worn when an employee moves from place to place hold this exposure information to be read out at the end of day on a combination indicator/battery checker/calibrator. Panel lamps on each indicate if the instantaneous level has at any time exceeded 115 dB for 0.5 second or longer, and if sounds in excess of 140 dB have been detected no matter how short their duration. Other Noise-Measuring Instruments. 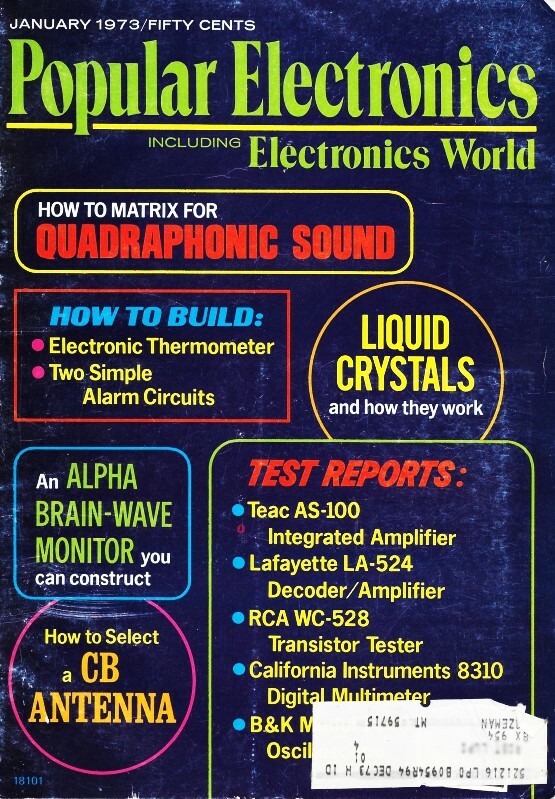 For further analysis of sounds in a manner equivalent to human hearing, frequency analyzers are available with constant-percentage-bandwidth filters. Since we hear octaves as equal intervals of tone, it is desirable in the analysis of noise frequencies to use filters that are an octave or fraction of an octave wide. These filters can be a single filter that is continuously tunable, a series of filters that can be switched in steps, or many filters in parallel. But the bandwidth is usually a fixed percentage of the center frequency, about 70 percent wide for octave-band filters (Fig. 4) and about 26 percent for 1/3-octave bands. Impulse noises, like those produced by explosions or punch presses, can have serious effects on hearing and, so, need to be measured. Meter movements are typically too sluggish to respond to brief noise impulses and the eye too slow to note accurately even the peak value. Storage oscilloscopes greatly aid in the analysis of short-duration noises, but they do not provide simple numerical readings and are difficult to use in the field. An impact noise analyzer has been developed to capture the fleeting characteris­tics of impulse noise with storage circuits. 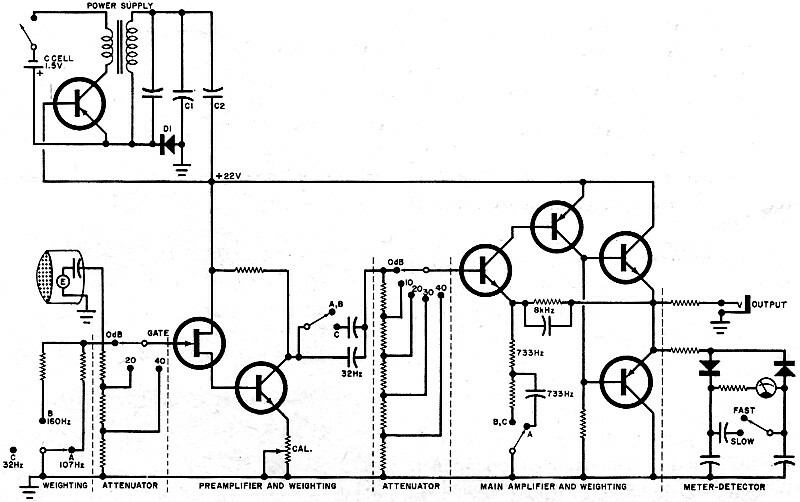 The "quasi-peak" integrator circuit with a 0.25-ms rise time responds very quickly to the rising level of an impulse. A built-in sluggish decay time (about 600 ms) permits the operator to "eyeball" an approximate peak value more easily. While this is happening, a "peak" storage circuit with a 50-μs rise time holds a voltage, related to the peak sound level, to be read at the operator's leisure. Another storage circuit is charged from an averaging detector with a selectable time constant. A "time average" reading taken from this storage circuit will be proportional to the duration of the impulse. From these three quantities - quasi-peak, peak, and time-averaging - the impulse can be well defined and compared with the characteristics of other known noises. The electronics industry has provided the field of acoustics with an arsenal of sophisticated measuring tools that do an excellent job of simulating the peculiar behavior of human hearing. But much still remains to be done. In medicine, transportation control, communications, and computers, the greatest challenge will be to ensure that human needs and peculiarities determine the performance of electronic systems - not the reverse.